In a world where everyone is assigned a lifemate at birth by the Gods, thirty year-old Honor is still looking for hers. When her new boss, Sedric, points out that her mate probably died before they met, Honor embarks on a quest for closure. She needs to know who her mate was and what he was like so she can move on with her life. Sedric is determined to help Honor, because he understands the emptiness she’s feeling. As they search for Honor’s lifemate and get to know each other, they start to wonder if the only kind of love is that which is fated and if there really is only one person for everyone. My first book, Twenty-Five, is a Contemporary Romance through and through. It’s about a couple meeting, dating, falling in love, and everything that goes with that. Honor’s Lark, on the other hand, is a bit harder to categorize. Honor doesn’t realize she’s in a love story until almost the very end. There’s also the fantasy element to take into account. She lives in a world with one big difference from ours. Writing without a clear genre is so much fun. I got to break rules and conventions and be really unique. Of course, I wanted to appeal to the readers who read the first book, so there is a bit of the Romance genre formula (the implied Happily Ever After). Find a community of writers, whether online or locally. Other writers are your best resources. My writer friends and I schedule time to get together and write; we discuss plot, characters, dialogue, setting, editing, etc; we beta read for each other; and we provide encouragement when needed (and when not needed!). 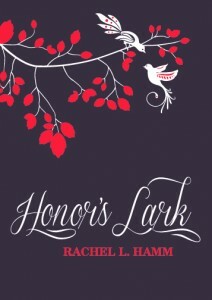 Funnily enough, I was inspired to write Honor’s Lark by a pin on pinterest! That site is just a plethora of great ideas. There was a post where someone wished everyone had a charm (for a bracelet or necklace) and your soul mate had the other half. When you found your soulmate, the charm would warm up so you knew you found the right person. The post stayed with me and soon I was thinking about a world where love was pre-destined and what that would look like. Would people be spared the pain of heartbreak? Would love always be a guarantee? What type of character would be the most interesting in a situation where everyone is paired. The story snowballed from there. Rachel is the author of Twenty-Five, a love story, and Honor’s Lark, a romantic fantasy. She was born in Buffalo, NY but grew up in Burlington, NC. Raised by northern parents in the south, she likes to say she got the best of both worlds. Her writing is inspired by classic authors like Jane Austen and Charles Dickens, as well as contemporary ones like JK Rowling, Gayle Forman, and Claire LaZebnik. She loves to read and has been known to spend an entire weekend engrossed in the adventures of her favorite characters.